*Regular nightly rate is $149. Weekly rate is stay for 7, pay for 6. Your reservation total will include a cleaning fee and bed tax in addition to the rental rate. 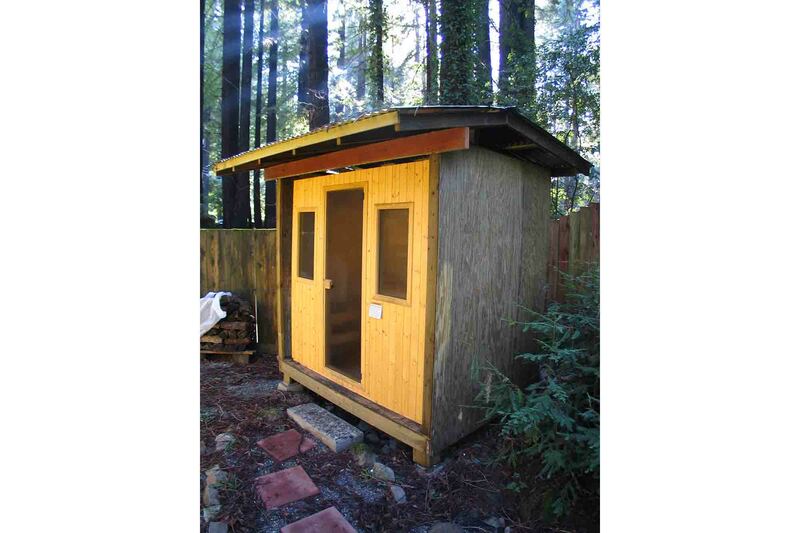 Snug Cabin with Lots of Charm under the Redwoods, Fenced Yard, Finnish Sauna for Four, Woodstove; Short Drive to Creek Access, River Beaches, Coast. WIFI. Your Well-Behaved Dog is Welcome! The living room is open to the kitchen, has a dining set and opens to the wrap around deck and yard with outdoor dining and sauna. Directly off the main living area, there's a bathroom and a bedroom, with its own entry to the yard, just steps to the sauna. There is a public creek access nearby. Max Occupancy: 4. Max Automobiles: 1. Quiet Hours 10pm-7am. No outdoor amplified sound at any time. Absolutely beautiful location! Perfect for a couple with a dog we really loved it! We will be back! Quiet, remote, relaxing and perfect for a romantic getaway! Very nice place. Had to cross Cazadero Highway to get to the creek, but location was very nice and clean. Recommended. We were lucky enough to find the Lemondrop for a last minute holiday weekend getaway. 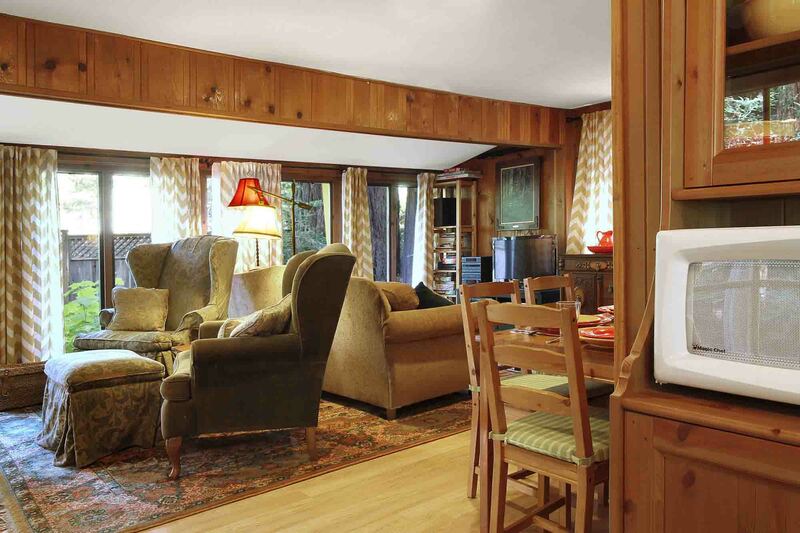 It is the perfect quiet retreat, and dog friendly. The property is completely fenced in, allowing for privacy, and is a short walk to public river access. This is the type of place that you should rent for the week and just relax. We would definitely return but recommend the following: Plan meals and shop at the nearest Costco/grocery store ( maybe Santa Rosa? ) on your way in. The local Safeway has a good selection of items but the prices were high and there were many transients hanging out in the parking lot. Make sure to fill up your tank when you arrive. We took a drive along the coast and the gas station was closed in Bodega Bay. The nearest one was 10 miles away in Jenner ( very close to the property - fill up here before heading out for an adventure.) Arrive during daylight hours! There are two spots on Cazadero Hwy that were washed away by flooding. There is only one lane in these spots and you must drive with caution. Stay here to fall in love! 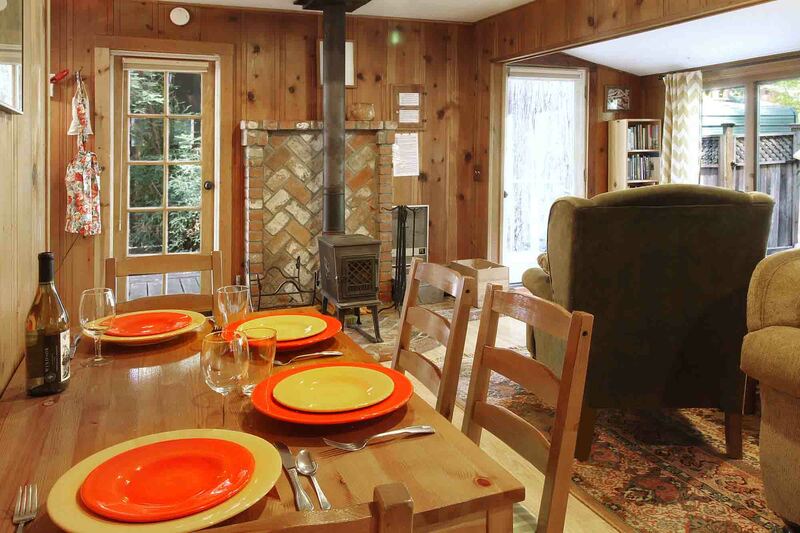 Modest but adequately equipped small cottage amid the Redwoods. We were there during dreary, rainy weather so the place was pretty dark. Great for a casual groups, probably more appealing with some sunshine. WIFI is very good, didn’t try Sauna. Heating more than adequate. Advise bringing groceries in as there is nothing nearby for shopping or eating out. Well, not within walking distance anyway. Fun spot. The dogs loved it! 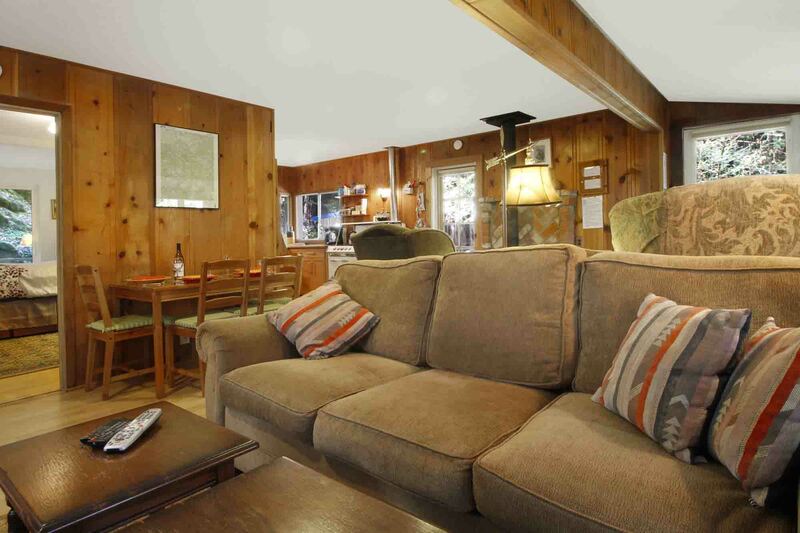 Cute and close to the redwoods, river, and the beach! We loved the sauna. Fun stay!! We really enjoyed our stay. The location was beautiful. Huge redwoods on the well maintained property. A good functional grill and the wood stove and sauna were a real treat. Can't wait to visit the cute little yellow house again!! "We had an amazing time at the Lemon Drop! " Lovely, cozy (loved the wood burning stove and firewood supplied along with kindling). 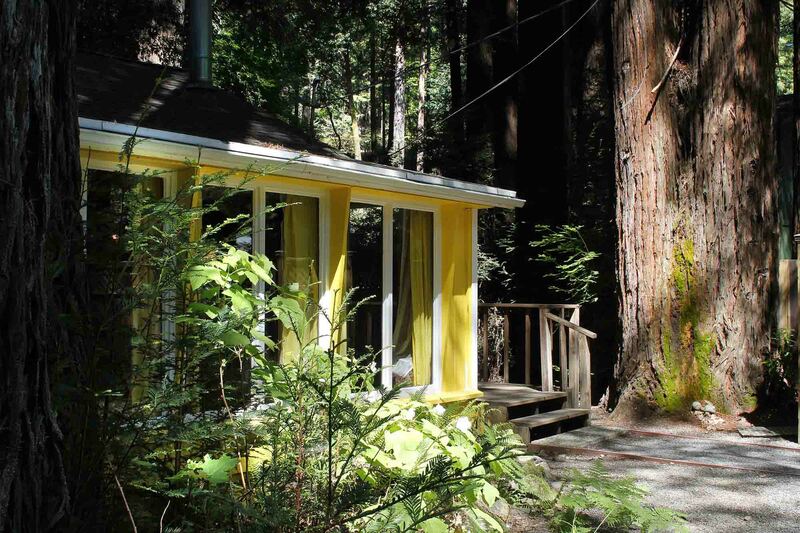 Very quiet, private, relaxing getaway among very tall redwoods! Would totally come back, even our dog loved it. Great quiet serene neighborhood. Really cute town. I love the trees that surround the space, its a small space, but enough for two. The kitchen is great , with everything you need. The wood burning stove is great too. The bed was comfy, the sauna room was so very nice. Couple things i hope the property management company fixes, after many reviews, s the saggy couch, the old shower curtain, and the shower head, and knob, affix to wall. :) They refunded most of my cleaning deposit for the problems with the shower, and removed the old carpet in the bathroom, and did bring over more wood and lighters and matches when I called them. It was left with very little supply of wood when we arrived. They were really great with communication, exceptionally receptive, and were not aware of the condition of the bathroom, or the lack of wood, that the cleaning service had apparently overlooked. I think with a little time off for repairs, and replacing that couch ;), and some tlc, this place could be even better than it was. Thank you for the service, and for the space. Extremely beautiful and and a great city getaway. Would definitely go again. "Great little mountain river getaway"
Great little mountain river getaway. We stayed with our 3 yo daughter and were delighted to find plenty of games/movies/books etc to keep her occupied. Fun to light a fire in the little stove and was toasty warm even in cold November. Our only minor complaints were that the furniture was uncomfortable and musty smelling. We ended up spending a lot more time inside than we expected because of rainy weather and appreciated all of the options available. They also were happy to let us bring our pup but we found a sitter and ended up leaving her home. Very kind folks at the office called and let us know how to pick up keys after hours. We would stay again! "Very cute little cabin! " Very cute little cabin! Comfortable bed. Didn't have a chance to use the sauna but it looked nice. Note, only a sauna, no hot tub on this property. Really enjoyed the stay, the peace of being among the amazing trees, and the smell! It is a little close to neighbors on one side who you can see moving about their yard, over the fence. Not a big deal unless you're seeking absolute privacy. Would go back. A couple things to note, these are not negatives, just things to know in advance for a better stay: a. the wood burning stove is small. The normal size logs sold in bundles at stores won't fit, too big. At Friedman's I bought smaller logs, compressed cedar/redwood logs, which were perfect. Could not find axe on property to split bigger logs. b. Note that the keys are not on site, you need to go to the town of Guerneville, about 15 mins away, to pick up keys from office. Also to return them at check out. c. From the description I had the impression it was about 30 mins from Santa Rosa. But it is almost an hour, just fyi. Great little place, happy to have stayed there! We're so glad you enjoyed your stay at Lemon Drop, Cindy, and hope you will be back! Thanks for the feedback and the review. 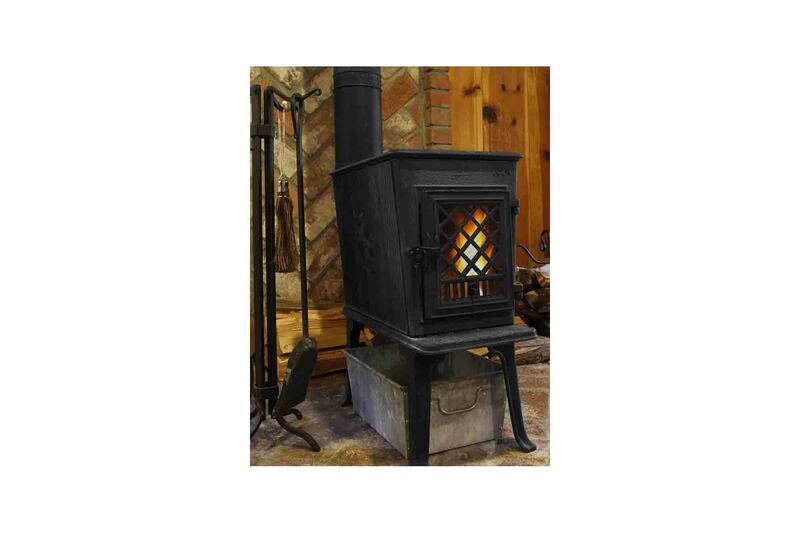 We will add a note to the listing about the stove and check out how the distances are being listed. "Sadly, we didn't get to stay..."
Our reservation happened to be during the same week the horrific fires started in Sonoma County. So we canceled our reservation due to evacuations, hazards, etc. We were issued a full refund without any hesitation. Russian River Getaways was very professional & polite during the initial booking & when we had to cancel. 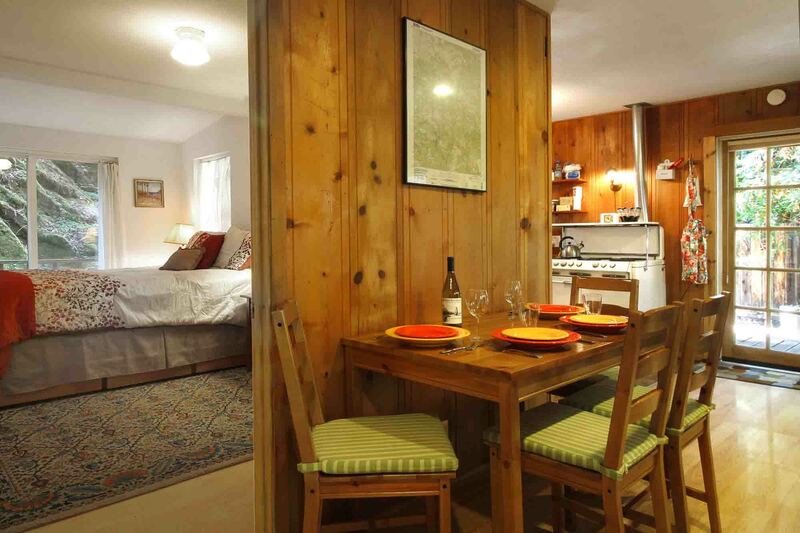 We will certainly try to book the Lemon Drop cottage in the future! "The Lemon Drop was a perfect getaway! " The Lemon Drop was a perfect getaway! Waking up every morning to the crisp mountain air, making dinner on the grill and being able to play board games by the wood fire stove every night was the best! There were a few slight damages from previous guests when we got there- but the employees in the office were very nice when we reported them when we returned our keys. Only suggestion I might add is a motion sensor light near the parking spot. We got in pretty late and trying to find the house (and parking spot) in the dark was a little stressful. Overall would (and already have) reccomend this location to others! "If you are looking to get away in the forest this is the perfect place"
If you are looking to get away in the forest this is the perfect place. It has 3 BR & 2 BR. We were housed there when our original reservation had issues with a water heater, therefore we never used the upstairs at all, but it would be a great rental for a family or a group. In addition to a spacious deck and a hot tub, there is a family room downstairs that has a pool table & is stocked with board games. There is also a wooden bench and hammock downstairs. It's very quiet and there is no cell service. Land line worked fine and the wifi worked quite well. There was cable service, with HBO, so I didn't have to miss the GOT finale! 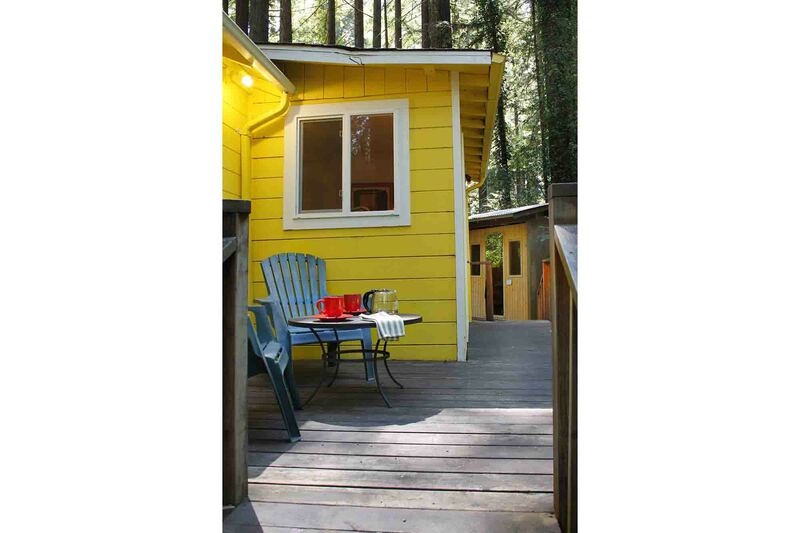 Lemon Drop is a nicely furnished one bedroom cottage complete with a full kitchen, an auxiliary wood, stove, and a sauna located on Austin Creek Road West of Guerneville three miles east of the Cazadero Music Camp. We enjoyed our stay at the Lemon Drop. The fenced in yard made it fun and easy for our dog. The cabin was small and cute. It was just what we were looking for! 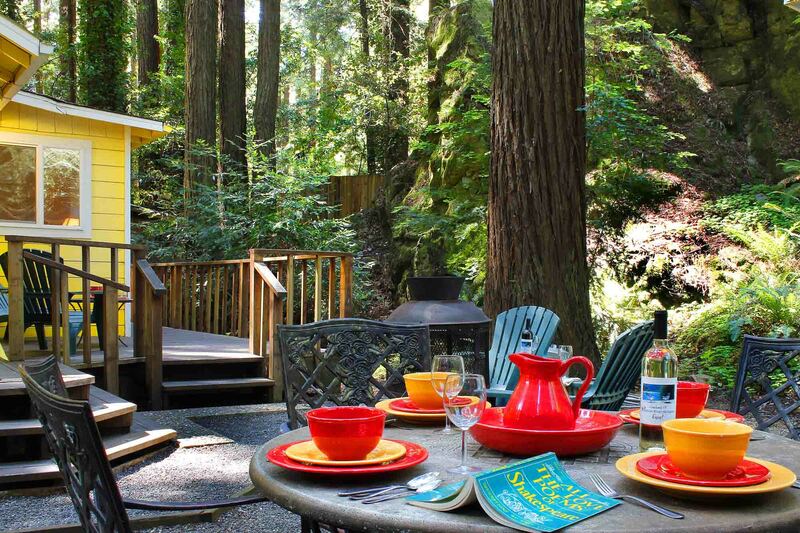 Cazadero is a great place for a quiet and beautiful vacation in the forest. Fantastic area reachable from a great cabin! Lemon Drop is a family cottage. It's obviously been around a long time. It's not ready to be open for business, however. Some of the things that need to be addressed: no way to light the stove/oven, bathroom lantern swings off its base, gate door broken, curtain rod in bathroom broken, main light in bathroom only goes on with bathroom heat, toilet seat broken, couple other curtain rods broken, coffee maker not working correctly, screen door in bedroom broken, so bugs come in if sliding door left open. The backyard is lovely, however. Overall, the place has nice potential. It's a cute old home. But that's what it is. An old home. Not a place ready to be open for business. Great place to come and just hang out. Very nice outside. Cazadero is a great place. 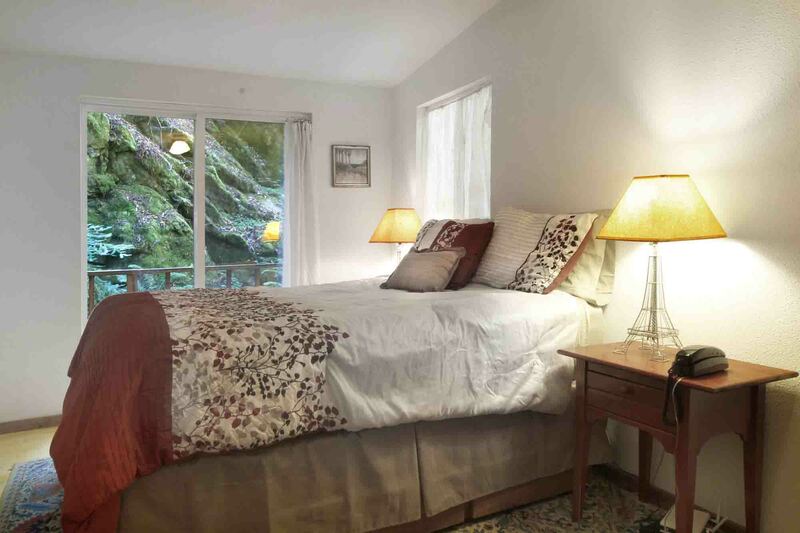 The property is just off a Cazadeo Highway (minor road noise) and just across the road from a cute little creek, a five-minute drive to a cute bakery, and about 15 minutes from Guerneville (the biggest town nearby). The patio and yard are great, perfect for a furry friend. Keep in mind the place is a cabin in the woods, so there is a little bit of the old cabin vibe inside. "Great place with sauna and dog friendly!" Great place with sauna and dog friendly! Super cozy, quiet, and we loved the creek nearby. The cottage/cabin is adorable and the owner was very communicative and helpful. "We had such a great weekend at Lemon Drop! " We had such a great weekend at Lemon Drop! It was great that they accept our small dogs as well. They really enjoyed getting out of the city and into nature. The enclosed yard rocks! Speaking of rocks, the giant wall of boulders behind the house is stunning. It's over 20 feet tall and covered in green moss and ferns. A redwood forest fantasy. There were plenty of games to keep us entertained and yes, we did watch tv which was great. Also, the internet speed was surprisingly fast for being out in the woods. I would certainly recommend this rental. It's proximity to the pastries at the Gold Coast Café in Duncans Mill's, are worth the stay alone. :) Thanks again. It was a cute little cottage, great for a weekend getaway! "Wonderful location -- very peaceful and cozy"
Wonderful location -- very peaceful and cozy. We enjoyed our weekend and appreciated the dog friendly getaway! Super easy and convenient check-in and check-out. "We had an amazing weekend at the Lemon Drop"
We had an amazing weekend at the Lemon Drop. It's really nestled in the woods in a very cool area. The sauna is very relaxing and puts you in touch with nature. We had a lot of fun with the furnace and really appreciated firewood being supplied! Cooked some great steaks on the grill too. Everything was very smooth and idyllic. Great place. Had all the amenities. Sauna was awesome. Very comfortable. Would definitely stay here again and recommend for a weekend getaway. 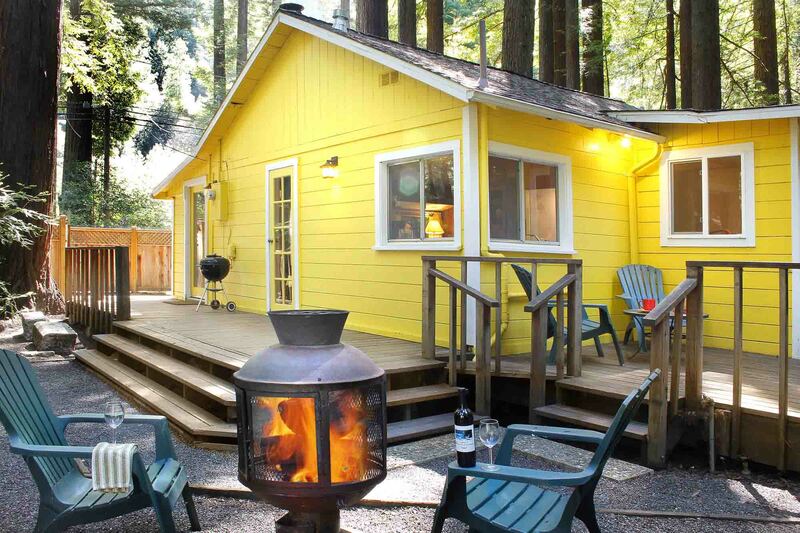 "Lemon Drop was cozy, warm and clean"
We had a fabulous little post holiday/my husbands birthday get-a-way in Cazadero! The Lemon Drop was cozy, warm and clean. The fenced in yard was not only incredibly convenient for our two dogs but really beautiful as well! The sauna was pure bliss after spending our days strolling the epically gorgeous beaches nearby. The only surprise for me was that the house (although fenced off) is right on Cazadero Hwy, which fortunately is not heavily traveled. We would certainly stay at the Lemon Drop again! As advertised and all issues have been addressed in other comments. "Lemon drop is a charming "cabage" (cabin + cottage)"
Lemon drop is a charming "cabage" (cabin + cottage), rustic and very quiet. I spent a week with my 2 dogs, relaxing and reading in front of the fireplace (all was ready to easily start and keep the fire on) or taking the dogs to the beach (blind beach is only 20 minutes away and really beautiful). The cabin is very well equipped, the couch and bed are comfy, wifi works very well, and the bathroom has hot water (just make sure you're patient and have it run few minutes before it warms up). The best was the fenced backyard as I didn't have to worry about my dogs when they were outside. Highly recommended and I hope to be back soon. 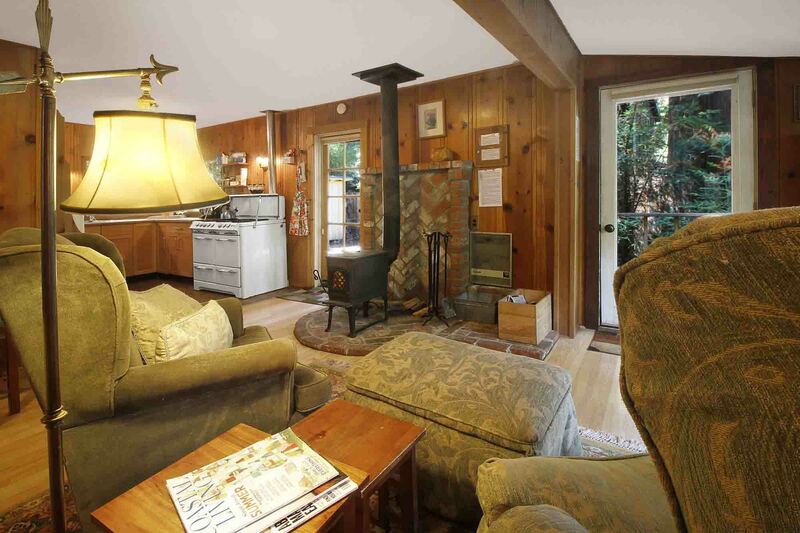 Nice little cottage, well maintained, cute, and a great stove fireplace. Took a while to figure out how to get the place warm, but there was very helpful instructions on that left by the owners or property managers.A great experience! Perfect for a couple. The place itself was the cutest cabin I've ever stayed in, the bed in the room was more comfortable than my own expensive bed!! There is a little bar/restaurant just 3 or 4 min down the highway that has the most delicious bread, we bought a pizza for dinner(also glorious) and the bread for toast in the morning, my husband wants to call and beg them to ship us some. The cabin is very small (perfect for two and romance) and soooo cozy!! Well insulated, you can't hear the highway at all, the kitchen had a great set up, though a few glasses would be a nice touch.they do have frosty mugs in the freezer and nice big coffee mugs. There are a few board games and movies along with a stereo with cds. We consider ourselves "cabin connoisseurs"
Was a cute and cozy cottage, with a wonderful area to grill outside. Perfect location for a weekend away from the city! Russian River Getaway's were really wonderful in making sure we had all the information needed to have an incredible stay. They were able to make great recommendations on things to do, and even the best restaurants for a romantic sunset dinner. The house was well equipped, and our only negative call out was that there is no warning about the hot water- the shower takes 20 minutes to warm up! We almost called in an emergency thinking the hot water heater was busted. Otherwise, a lovely quaint house nestled in the woods. Very nice, comfortable cottage (the owner calls it a "cabbage" because it's a combination of a cabin and a cottage). We fully enjoyed the deck and the sauna, and the dog fully enjoyed sniffing around the fenced-in yard. Bed was overly soft to my liking and and a bit slanted but not terrible. Loved the chiminea outside, and I just love the lemon drop paint job. Excellent location to explore the Russian River and Sonoma Coast from. Recommended. "My family and I had a great time here! " My family and I had a great time here! The booking process was really easy with just a quick stop to the main office to pick up keys in Guerneville. I was in contact with Justin at Russian River Getaways and he was very very helpful when it came to addressing any issues. Prior to our stay there we were informed that the glass on the wood stove inside was cracked and may not provide the heat it normally would for the house, but when we arrived they had gotten it fixed for us. The gas grill was out of propane as well, but they were very timely when it came to replacing it by the time we needed it to grill for dinner. Sauna was a such a nice treat and the steel chiminea in the back was also awesome. Wouldn't hesitate bringing my family back here for another getaway. Amazing, quiet get away. Absolutely perfect. Both fireplaces, inside and out were easy to use and very romantic (huge amount of more chopped wood provided). The kitchen was fully kitted out with all you could need. A beautiful stay - thank you! The listing was accurate, the process was smooth, and the house was lovely. The location is gorgeous and great for cyclists. The sauna was such a treat! My only critical feedback would be that the house smelled a bit musty - which may be common in the Russian River area, but it did aggrevate our allergies a bit. Other than that, a perfect stay and lovely home. "We enjoyed our stay at Lemon Drop"
We enjoyed our stay at Lemon Drop. It is a cozy home with a beautiful rock outcropping out back. 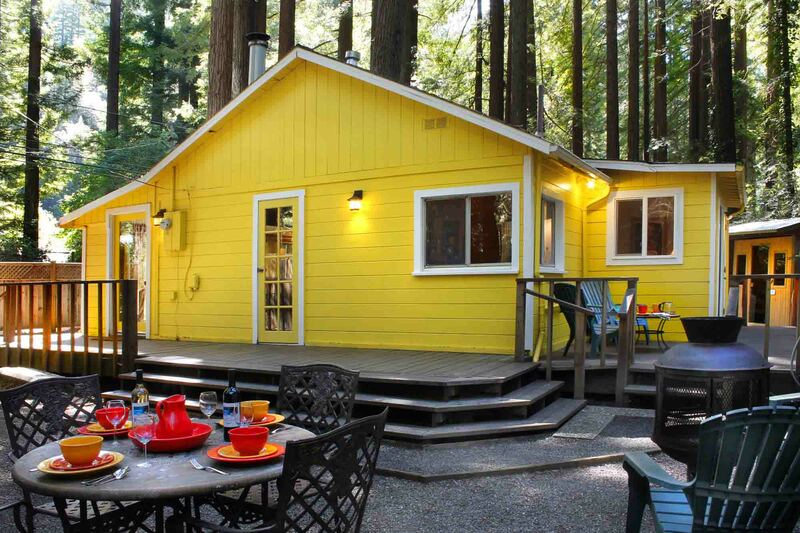 Our base for winetasting and hiking around Guerneville. It was a great and cozy, quiet place. We visited with a small child and put up a travel bed in the bedroom next to the big bed. House was comfortable, air smelled like lots of pine trees, and kitchen was charmingly old but still very functional. There were also a lot of board games for kids and adults, VHS (yes! ), DVD, and Cable TV. There was also a drawer full of movies for kids and adults and some books to read.The only negative for me was the mattress on the main bed. The bed was pretty high and the mattress was soft and sagged very easily. My back wasn't happy with it. This is a snug and cozy house with many thoughtful touches. The wood-burning stove and sauna make it extra special. The kitchen is well equipped and the whole layout is perfect for a full weekend of indoor fun. The creek is nearby for a nice walk and fresh air. The Lemon Drop was so very clean. It has everything in the kitchen you would need. The only heat source is a small wood stove, but it was enought to keep the cabin warm. The curtains in the house look like ripped up sheets, very bad The yard could be improved. It's just gravel. It has a beautiful sauna, we never had time to use. The only negative thing, beside those horrid curtains is the yellow paint, your in a beautiful nature area, lined with trees, every other house in the area is painted to fade into the natural background. Why bright yellow?? We really enjoyed the house. "sweet cottage in the woods"
Sweet cottage, floor to ceiling windows all on one side so light came in everywhere. Owner thought of everything--super-comfy bed, vintage but functional stuff high on charm, nice porches with comfy chairs, HBO a nice surprise. Creek right across the street which dog enjoyed, felt shielded from neighbors by trees and high fence, kitchen well-supplied. Unfortunately fence allowed my dog to escape into neighbors yard, luckily no harm done and owner says will work on solving that (only) problem. Was great for one, would be great for two. Got the sense that owner really cared about making the place perfect. Easy and picturesque drive to great bakeries and coffee in all directions, close to both Monte Rio and Duncan's Mills. Great time &amp; definitely recommend! "Great place for a weekend getaway!" 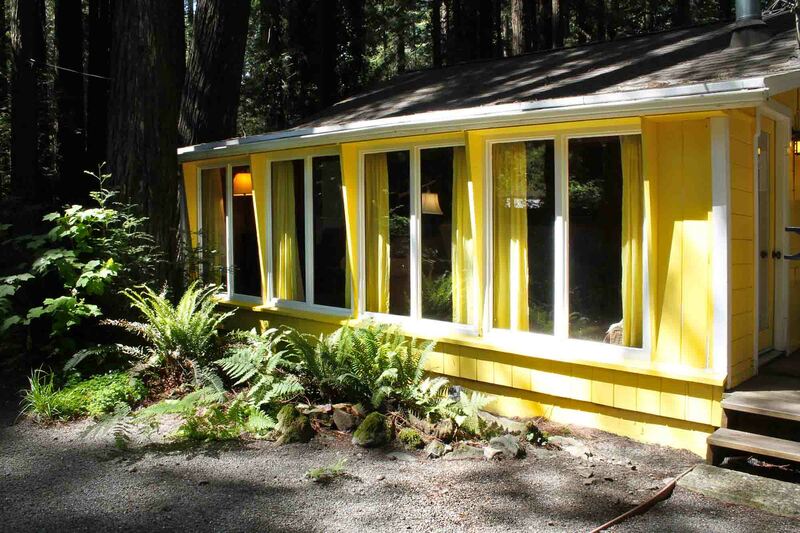 I recently rented Lemon Drop for a weekend stay in Sonoma County. The house was stocked with cooking/cleaning supplies, amenities were fantastic, and the fenced-in yard was perfect for running around with my dog. The cabin was very convenient to the town center, which was a very nice bonus. All in all, I had a fantastic experience with Lemon Drop and would stay there again in a heartbeat. We knew it was going to be a cold weekend, and brought tons of extra blankets and sweaters, but never needed them. The heat was on when we arrived and the house was very warm. The wood-burning stove was perfect for keeping us warm throughout the weekend and the dog decided she need to sleep on the floor next to it all day. Everything we needed was available - we hope to come back in warmer weather to really appreciate the outdoor space and river! "Awesome, relaxing, welcoming and beautiful!" We stayed at the Lemon Drop between Christmas and New Year and we loved it. It was the perfect size cabin, spacious for two people and one dog - we even had friends visit us and stay over one night of our trip and had plenty of room. 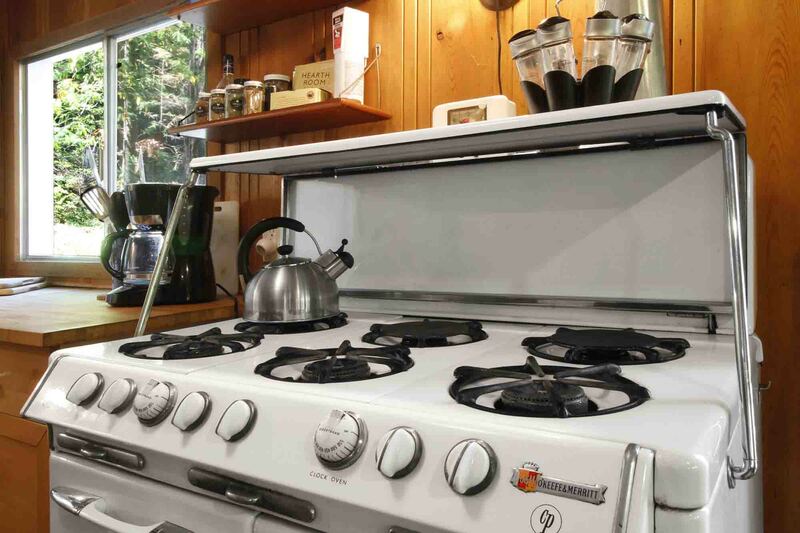 The little stove heats the place nicely, the kitchen is great to cook in - we were super comfy. The area is beautiful, and remote enough to feel like a full getaway but close to the beach, to cute little towns, and good wineries and breweries. The place was spotless when we arrived and they'd left a little bottle of wine for us as a treat. We'd love to come back - we got engaged over our visit so this might become an anniversary trip for us! My husband and I decided to have a weekend getaway for our wedding anniversary. 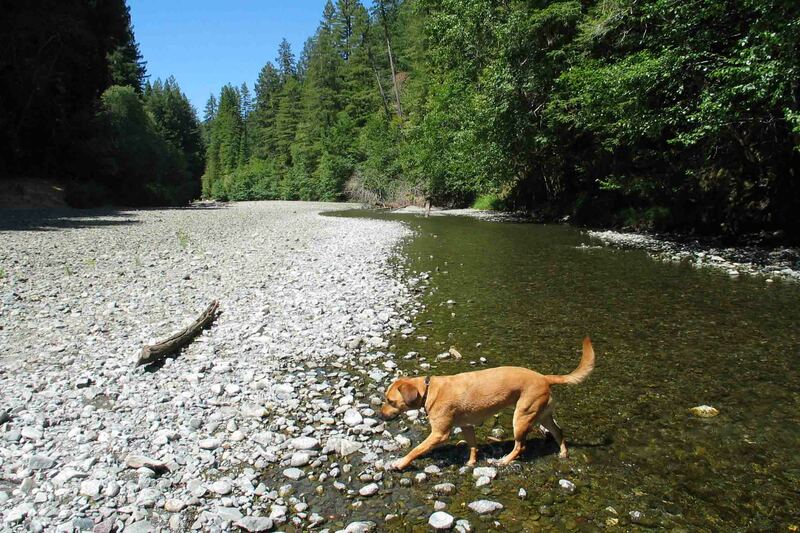 Russian River Getaways was the perfect match since we were able to bring along our dog. 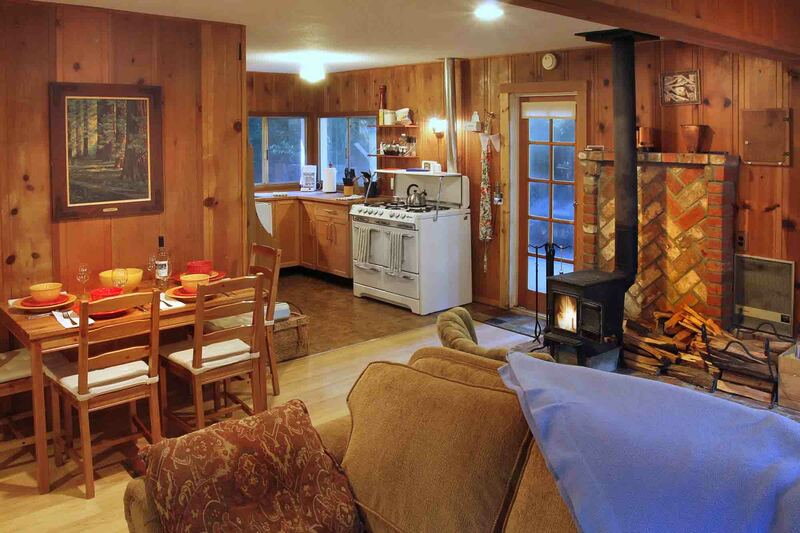 The Lemon Drop cabin is adorable - we fell in love with the wood burning stove and the antique stove/oven. The yard was fenced in so our dog was able to run around off-leash, and he had an absolute blast. 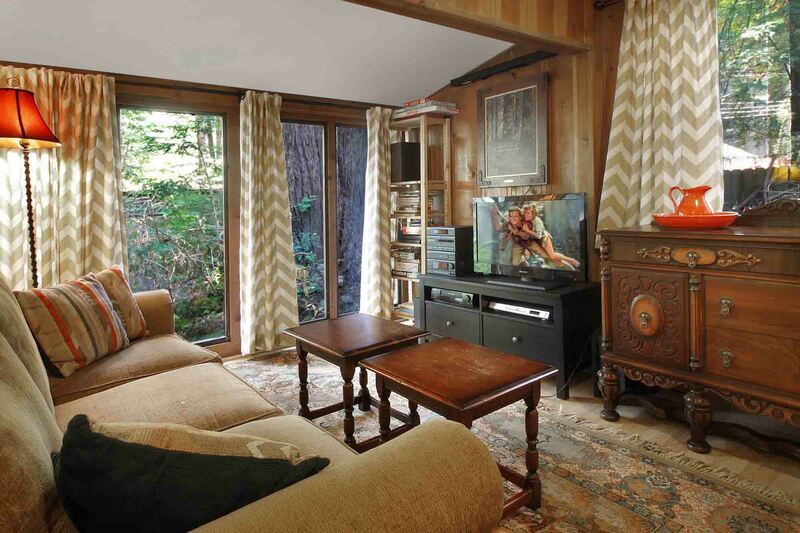 The cabin is nestled under redwoods and the porch is a peaceful place to spend a relaxing afternoon. Creek access is just a short walk from the cabin and the Pacific Ocean is just a short drive away, perfect for a day trip. We did not try the sauna but are hoping to on a return visit. Every interaction we had with the staff was pleasant and helpful, which just made our stay all the better. All in all, we had an amazing stay at the Lemon Drop and have decided to make our visits there a regular occurrence. Thank you for the perfect anniversary weekend. 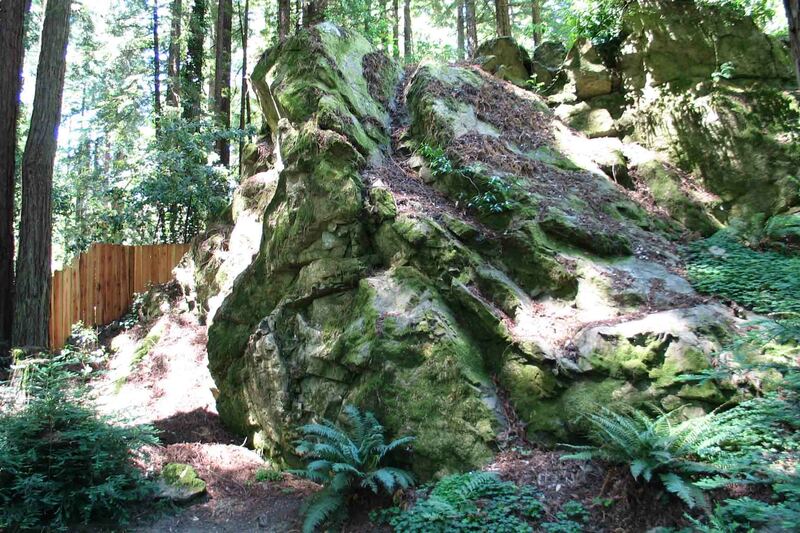 "Dogs & we loved our stay in the Redwoods"
There are over 20 redwoods on this small lot. There is a feeling of deep peace even though it is on the only road into this valley. Our two dogs loved romping outside - the entire house is enclosed by fence on three sides and the big rock in the back. We did have to stay out and play with them as otherwise they would want to adventure up the huge rock in the back yard. Heating with the wood stove was easy as all the kindling and various sizes of wood were provided. It was a great location for going both to the ocean and to wineries. Bring a flash light if you will be arriving after dark. You pull a string to open the gate - hard to find in the dark! The wine picnic kits were fun to use. "Lemon Drop - A nice little spot"
The Lemon Drop is a quaint rustic "cabbage". Not a cabin, but not a cottage either! The fenced in yard was great for our two dogs who loved exploring the little rock mountain in the backyard. We have stayed at a lot of properties in the Russian River area and while the Lemon Drop did not have the all the amenities we prefer (hot tub, direct access to the river, off the main road), it was more than adequate for a last minute vacation. In fact, it was great! We dont have dogs and the first step in the cabin you see two chairs dirty. In the bedroom the heater is making a lot of noise, thanks god we were there for three nights only. No dishwasher is a big No, No. the dishes are washed by hands and the last person that washed the silvers didnt do a good job, we find food on the spoons. for public safty the dishwasher is a necesity. we had 2 teenagers with us and all day long we just washed the dishes. I dont consider that a vacation when you spend all your time washing dishes. No cell reception or Tv or radio. The cabin has some DVD and Cd that you can use. No Hot tub just a sauna. No gas grill. Bad experience. lemon drop was a cabin in the woods; sort of! lots of traffic located on busy river road; check in was the most rudest ever arriving around 5pm with an employee inside not answering to a knock at the office door i fumbled with a safe that had the cabin keys inside; she finally opened the door opened the safe and tossed the envolope to me ; i asked how do i get to the cabin? reply: should of printed paper work dont have time for this last for yoga and ran down steps and drove off with me standing there! when traveling you do not always have a printer in the back seat; it ruined the whole trip; i finally found the cabin stayed 6 days not a call to check how my stay was going, no maps of things to do, nothing needless to say i checked out a day early,the cabin needs a face lift stero was not working lamp was in bad shape went to turn it on it fell apart, i fixed it; i also cleaned the cabin befor i left which was in better condition by far upon arrival; so leaving was hoping to recieve a refund for additional night i did not stay but expected no more then i recieved; zero refund even after i cleaned ,washed all linens and if the company would leave a welcome package instead of a list of rules to follow i think they would see returning clients, also customer service needs a huge inprovment, also my option owning my own business; i would never recommend the russian river to any one i personally know, but hey just my option i was so looking foward to arriving, was totally shocked upon doing so, so that warm greeting basically ruined my stay. i was shown zero respect and after paying over a thousand for my vacation whow, what was i thinking...very hard lesson learned. Ya think??? "Cute but a little stinky"
We loved the Lemon Drop. It's very comfortable and well-stocked. The BBQ, Sauna, everything worked great. We forgot to bring Dvds for our daughter, so we were very happy to find drawers of VHS tapes! Other reviews have complained about the proximity to the road, but that never bothered us. There was no loud traffic or anything, and we soon forgot about the road. The only problem we had was the funky mold smell. Right when you walk in the door you get a blast of mildew odor. Also inside the kitchen cupboards, and when we sat on the left side of the couch. We got some incense at the Guerneville flea market and that fixed the problem. So, I would still recommend the Lemon Drop, but just warn you to bring your own incense! "good enough, could be better"
Cosy little house, too close to the road, bed advertised as queen, was actually a full. Pull-out couch terribly uncomfortable. Fire alarms were inoperative, plug under dining table nonfunctional. House cosy, nice &amp; funky, too bad about the closeness of the road. Excellent location for quiet and restful enjoyment, near the forest, river and the Pacific Ocean! Lemon Drop was a nice, well equipped cabin with a slightly european flair. The books, movies and music were a nice addition. Our only real complaint was the pull-out couch which was very uncomfortable. Otherwise it was a nice size and restful retreat from our busy lives. "Whale of a good time!" What a pleasant and relaxing cabin with all the amenities that one would love. We used our cabin as ground central to all of our activities. Winetasting, eating at local restaurants, walking in the creek, drinking wine and grilling at our deck. Everything there is all you need for a wonderful time. We'd highly recommend and especially for a family with small dogs. Stella loved the Jazz music and dancing in the kitchen! A quaint little spot right off the main highway in Cazadero and across the Austin Creek. Three quick notes about my stay:1) Although directly across from the creek, the locals were quick to inform me that the majority of the creek bed is private property, with the public access roughly a mile away.2) The big plus for me was the fenced yard, although, for the record, the booklet provided at the cottage informs visitors that it is not fully fenced and does not recommend you leave your pet off leash. I have a pretty shy dog, so it wasn't much of a problem, but no doubt that a more daring dog could easily escape. 3) The cottage gets limited sunlight and is generally a bit lacking in privacy for my liking. The fence line at the front is not tall enough to shield the view from the highway (a bit of an issue if you want to have a sauna in the daytime) and the interior could likewise use some blinds. As it is now, the next three properties can easily peer in through the kitchen windows, which are completely uncovered, not exactly my idea of relaxing. The cabin has a rustic feel to it - the wood stove is the heat source for the cabin and a lot of the furniture pieces are antiques. The bed is very comfortable - you sunk in and didn't want to leave! 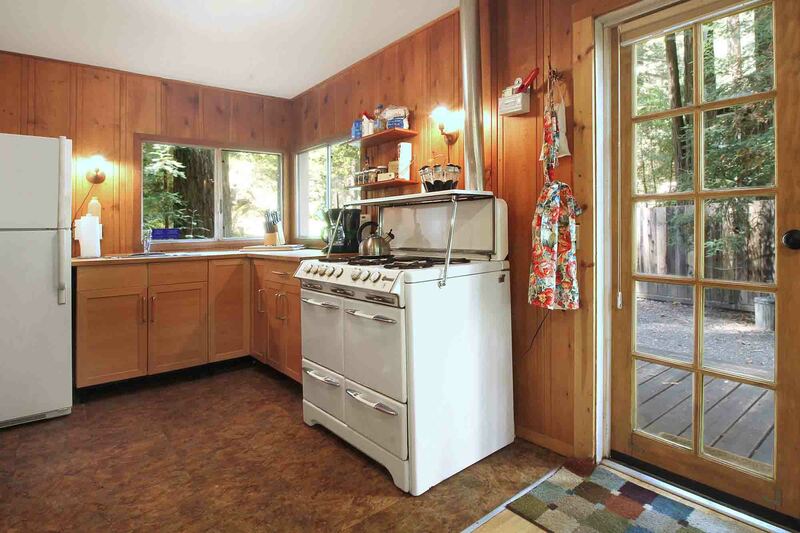 The kitchen was OK for light-duty use; the lack of dishwasher and the old stove makes it hard to do a lot of cooking. There's ample room to sit in the living room and the couch was very comfortable. There's a 20" tube TV with a VCR and DVD player, plus On Demand cable TV and high-speed internet. The Finnish sauna was great - it was the reason we booked this cabin. It does take a while to get really hot, however, and doesn't get over 60 C. The really bad thing about the cabin was the bathroom. It was tiny and run down. 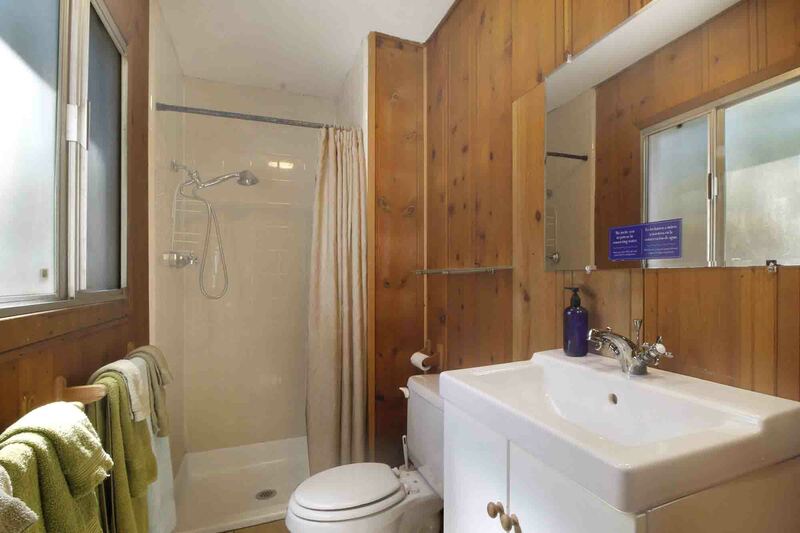 The walls are wood paneling and there was a lot of MOLD on the wall behind the towel rack - GROSS! There's no real bathmat, only two old bamboo placemats, which is not very sanitary since they can't be washed. The shower is the tiniest I've ever been in and the storage space in the bathroom is non-existent, except for the top of the toilet tank.